Menopause is a natural process that occurs in women’s lives as part of normal aging, a transition during which a woman gradually moves from being reproductive to non-reproductive. The transition has three stages: 1) perimenopause, 2) menopause, and 3) post-menopause. Perimenopause usually starts in a woman’s 40s, but can start in a woman’s 30s or even earlier. During this time, many women begin to experience uncomfortable and often embarrassing symptoms including hourly waves of heat, transient daytime sensations of blushing, rapid sweating, increased heart rate, followed by chills, palpitations, metabolism changes, elevated heart rate, and sensations of anxiety. A single episode of these symptoms is often referred to as a vasomotor “flush” event. Furthermore, night-time sweats often disrupt sleep, resulting in fatigue and irritability. Menopause is defined at one year after a woman’s last menstrual period, and post-menopause is the time after menopause. Even in the post-menopausal state, many women still experience vasomotor “flush” events. Indeed, while some women experience symptoms for only a few months or years during this entire transition, many suffer for 10, 20, or sometimes more than 30 years without relief. Now there is an answer for the discomforts of the menopausal transitions: Estrodyne. 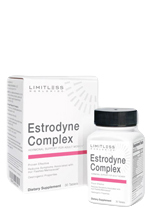 The optimized Estrodyne compound is soy-free and has been shown to significantly reduce the number, length, and intensity of these vasomotor “flush” symptoms in women over 40. * A 12 week randomized double-blind, placebo controlled study that involved 84 women was carried out to evaluate the efficacy of the Estrodyne compound. The women were between the ages of 40 and 65 years and undergoing natural or surgical menopause. Subjects were randomly assigned to one of two groups, receiving either the key Estrodyne compound or placebo. At baseline and over the course of the 12 week study, the number and severity of vasomotor “flush” events were quantified. Now there is a dietary supplement designed specifically to help address the hot and cold, the day and night sweats, and the associated anxiety and sleep deprivation caused by vasomotor “flush” events associated with menopause. * If you are a woman experiencing the vasomotor symptoms of menopause, Estrodyne Complex could make you feel like you never hit 40. Other Ingredients May Include: Microcrystalline Cellulose, Dicalcium Phosphate, Croscarmellose Sodium, Stearic Acid, Polyvinyl Alcohol, Talc, Silicon Dioxide, Polyethylene Glycol, Mica/Titanium Dioxide, Polysorbate 80, D&C Red 30 Lake, FD&C Blue 2 Lake. WARNINGS: Do not exceed suggested daily serving. Do not use if you are pregnant or nursing. Consult your physician prior to use if you are taking blood thinners; or if you have a history of hormonal or gynecological disease, including ovarian cancer, endometriosis, and/or uterine fibroids; or if you have a liver disorder or develop liver-related symptoms; or if you are taking hormone replacement therapy (HRT), including thyroid hormone replacement therapy. Ensure you are up-to-date on mammograms and gynecological evaluations prior to use. Consult a physician if symptoms worsen. Do not use if you currently have or previously had breast cancer and/or breast tumors or if you have a predisposition to breast cancer, as indicated by an abnormal mammogram and/or biopsy, or a have family member with breast cancer. Discontinue use and consult a physician if you experience breast pain, discomfort and/ or tenderness, or if you experience a recurrence of menstruation and/or uterine spotting. Keep out of reach of children. Use only as directed.